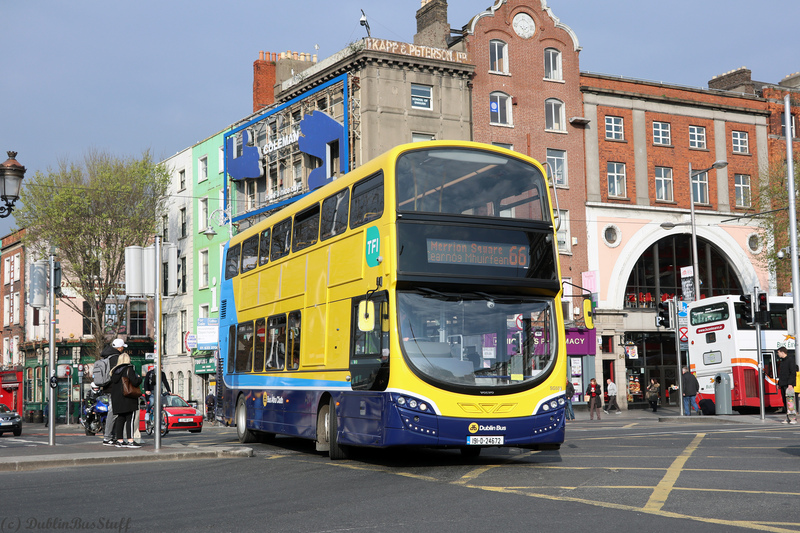 Phibsborough's brand-new SG548 is seen operating Route 37 at a crazy busy College Street on the 10th April 2019. Cyclists, pedestrians, many other buses, a luas, and a taxi can all be seen vying for space in this principle artery in the city. Behind, Hawkins House, one of the city's worst eyesores is undergoing demolition to be replaced by "College House", a new office building in the heart of the city (click on photo for larger version). 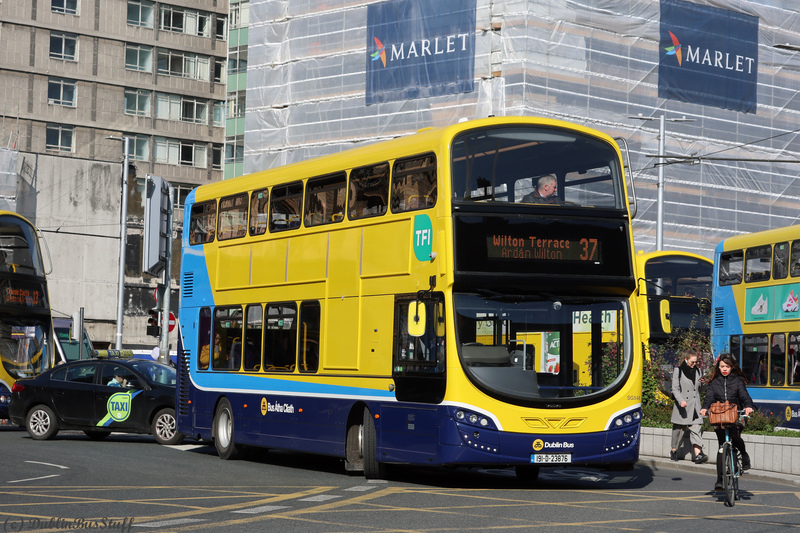 SG deliveries have continued apace, with only a breif interlude as Go Ahead were given a few new buses straight off the production line to full Dublin Bus trim internally. Ringsend's allocation of SG527-SG546 is complete, with AV415 being the last AV withdrawn there. Phibsborough were the next depot to receive SGs, with SG547-SG551 and SG553 entering service together there on the afternoon of the 1st April 2019. Phibsborough still await the rest of their batch, SG552 and SG554-SG566. Like before, these may enter service in sizeable batches. All AV buses have been withdrawn from operation in Phibsborough (except open-top tours), with AV439 last operating on the 22nd March. This leaves Summerhill's AV420-AV429 as the last remaining examples. Next in line for SGs is Donnybrook, which will get another batch of 15 buses. One would imagine these will be put on the new 155 route, displacing the mixed AX/EV/SG allocation on this service currently. 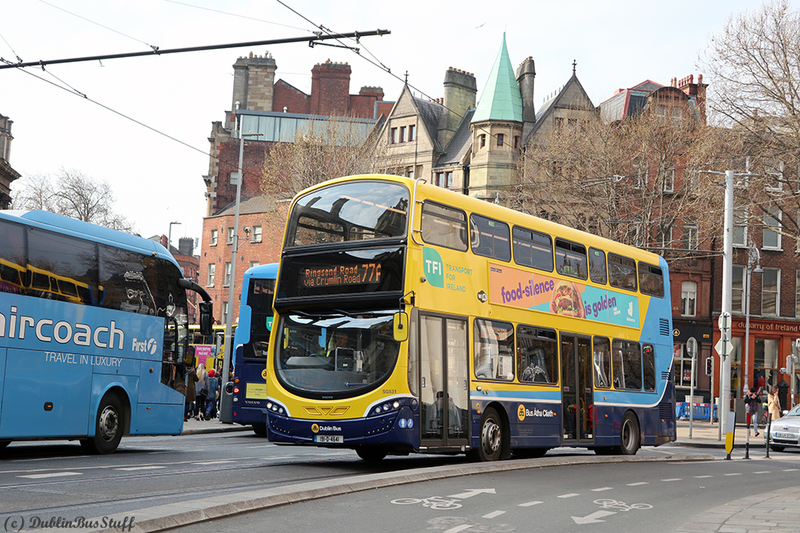 Ringsend's new SG531 is seen operating Route 77A on College Green on the 11th April 2019. As the SGs get into the 500s, which few Dublin classes have done, its hard not to thing of the AX equivalents, 531 being a number instantly remembered as a wedding bus in Ringsend (click on photo for larger version). Phibsborough's SG553, the highest SG numerically at the time of writing (14th April 2019), is seen on O'Connell Bridge operating Route 66 on the 11th April 2019 (click on photo for larger version).